Students must grasp a number of abstract concepts if they are to understand metallic bonding and metallic structure. They must construct images in their minds of cations, layers, delocalised electrons and electrostatic forces. This can prove very difficult so it can help students to create and use scientific models in the classroom. The activities below guide students through the necessary steps to create models of metallic lattices, either in the lab or on the computer. Students can use these models to explain many of the physical properties of metals. 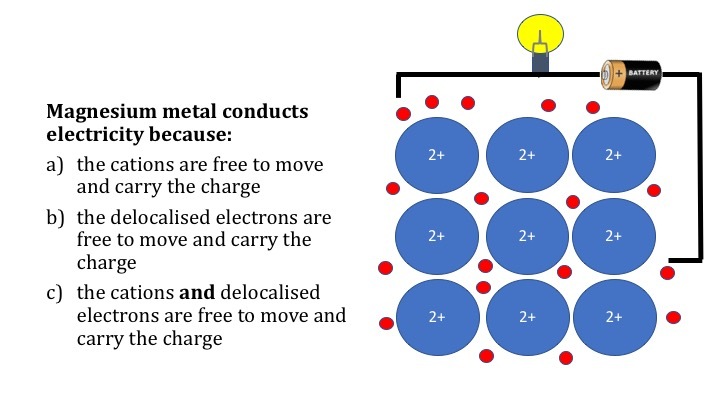 After thinking about this topic a lot recently, I think the key is to make sure students appreciate that it doesn’t make sense to consider metallic bonding between specific ions and specific electrons – the electrostatic forces of attraction are between the cations and the sea of delocalised electrons. GCSE diagnostic questions on metallic bonding. These diagnostic questions have been created to see whether students hold any erroneous ideas about metallic bonding. Different questions could be used in different lessons, or they could be used together to diagnose understanding during a sequence of lessons so that feedback can take place. Students can answer questions working alone, or they can be used as an opportunity to encourage discussion so that you can listen for learning and then respond. Answers are provided in the notes section below each slide. GCSE activity to create a moving model of a metallic lattice. Students evaluate a simple model of a metallic lattice that attempts to explain why metals are malleable. They use PowerPoint to create a moving model to show why metals conduct electricity, are malleable and have high melting points. This activity supports students to understand metallic bonding and structure and helps them consider what makes a good scientific model. The video below provides an excellent starting point to begin thinking about alloys. It introduces amalgam, any alloy of mercury and one or more other metals.